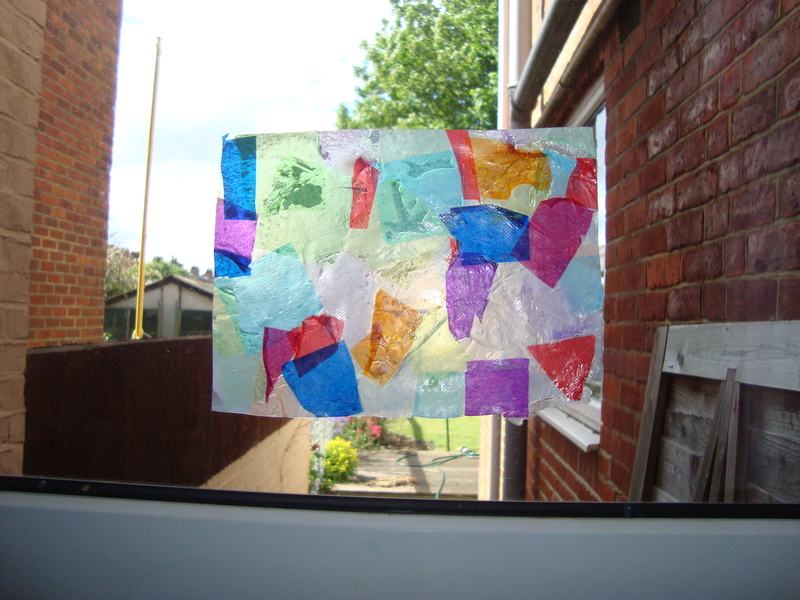 I am always on the look out for new crafts to try with the children so I was excited to try this idea out (can’t remember where I saw it!). It is so simple but very effective and can easily be adapted for different ages. Firstly, draw the outline of a rectangle (or whatever shape you’d like to make) on a non-stick surface with PVA glue. I used my wipe clean table cloth but do a little test first to check it will peel off once dry!). Then spread the glue all over the inside of the shape to make a thin layer. 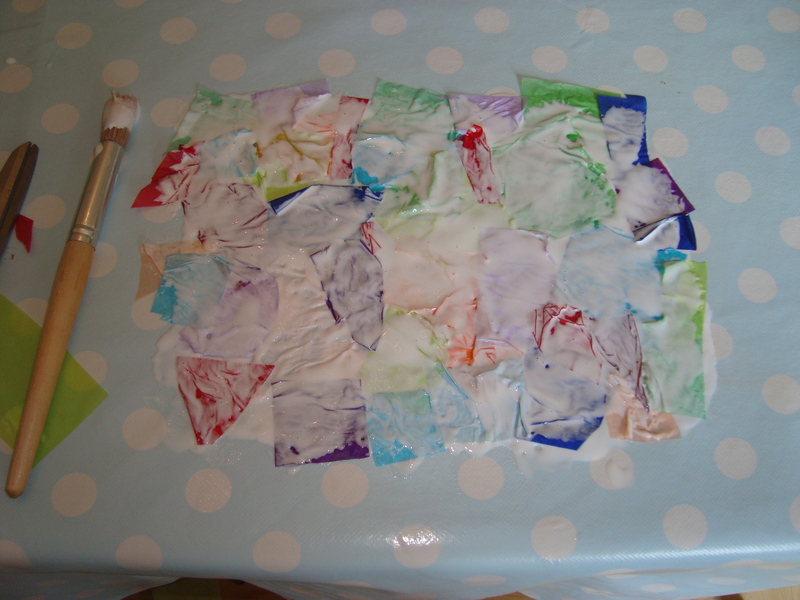 Next, stick down squares or strips of tissue paper all over the glue. I cut up the squares for Faith so she only had to choose the colours, but obviously older children can do this for themselves. We went for the random approach but you could stick them down to make a picture. Leave the glue and tissue to dry for a while then apply a thin layer of PVA over the top. 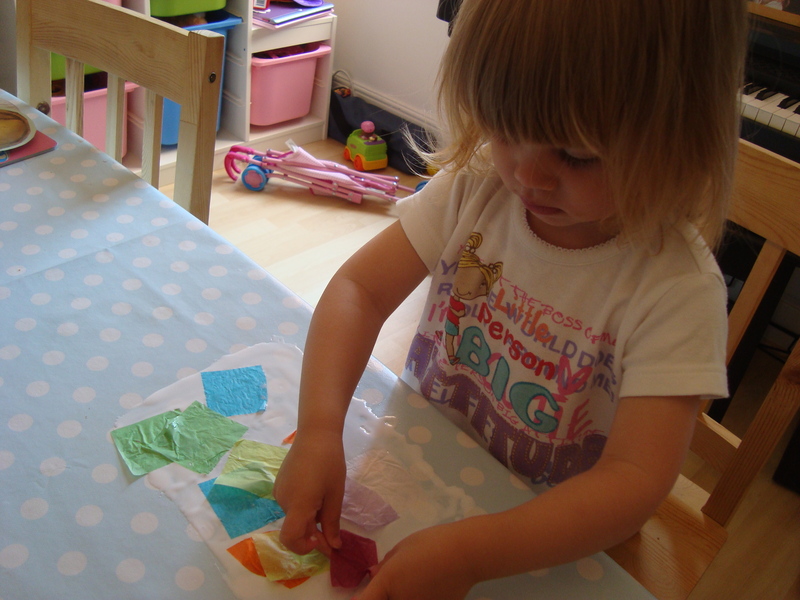 There is quite a bit of waiting involved in this activity, which can be good for toddlers with short attention spans but not so good if they are impatient to get finished! Leave to dry again and then apply a final thin layer of PVA glue. Then leave it to dry overnight. If you try to peel it off the table before it is completely dry you will get in a bit of a mess! Once it is completely dry you should be able just to peel it off the surface. And there you have it, a simple but effective window sticker! Grace was so impressed that she made several herself. She took them to show her teacher who liked the idea so much we never got them back! hey i’m 50 and i love the idea! sometimes i paint on the window using craft paint. thanks for idea. I’ve always wanted one of those window stickers that looks like a hawk: They scare away the little birds so they don’t fly into your window. Now I know how to make my own. Thank you for the advice. Oh so cool! I have a two year old and maybe he would like to do this. Was it messy though? I don’t mind some but I don’t want glue all over the couch, u know what I’m saying?!! Thank you! Maybe a silly question, but what is PVA glue? Is there a brand name? Thanks for all your comments, I hope you enjoy trying it out. 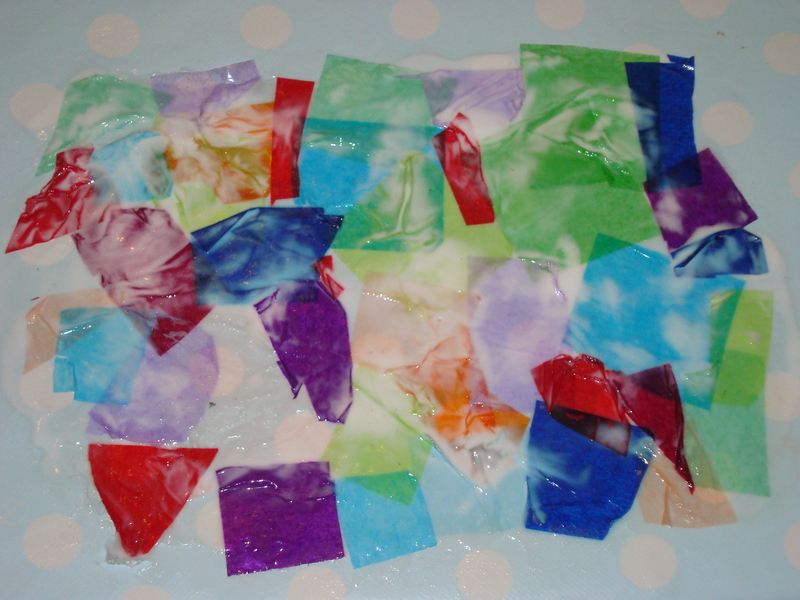 T – it can be a bit messy but PVA glue is good because it peels off stuff when it dries! Erynn Sprouse – I’m not sure what PVA is called in other countries. 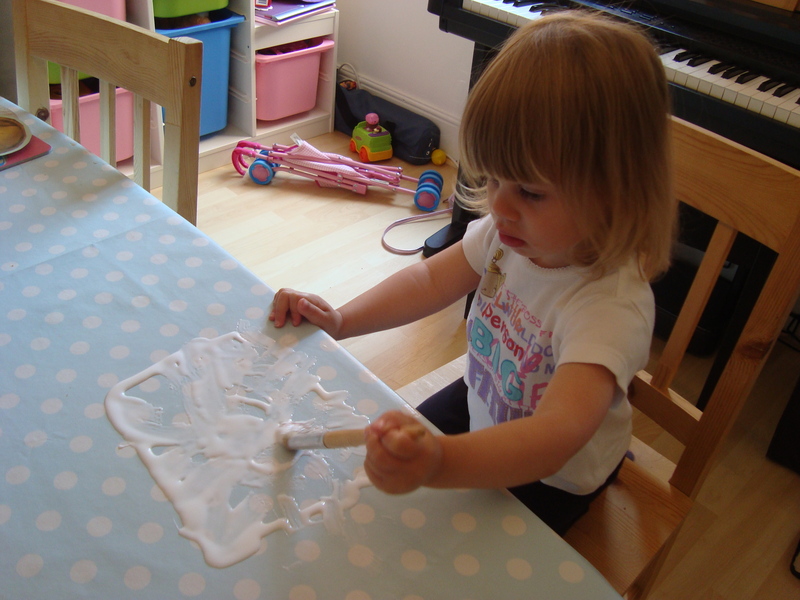 It is that thick white craft glue that children use, which peels off when it is dry! seems so much fun for kids…. i’d like to try it with my son and his cousins, im sure they enjoy it. Thanks so much for sharing this. That sounds like a great simple and effective way to decorate a window, might have to give it a try! Very nice & creative! I want to try it myself! I like the idea of a scary bird so more birds don’t fly into my windows, they always are!@! Congrats on being Freshly Pressed!!! My little boy would LOVE to have an excuse to paint PVA glue all over my tablecloth!!! He spread sun cream all over the TV yesterday in a bid to ‘clean it’. Seriously though, this is a great idea… I’m trying to arm myself with a list of things like this for our summer holiday activity list. 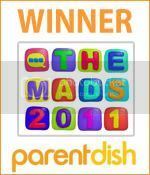 fantastic, I will be doing this tomorrow with my children! How clever! I’m going to try that with m nieces! Such progress from sticking paper cut outs of snowflakes on the windoes as we used to do…lol. sounds good – I’ll give it a try! This is a great idea, i try this for this for my self! That is a very cute idea, and a fairly safe one for kids I imagine! I want to do that…sooo fun!!! 🙂 pretty too. that is adorable! You made stained-glass windows… ones even I could make (clumsy+ knife= dangerous LOL). I googled PVA and one site said Ace Hardware carries it and any paint store. Look for PVA primer. I’ll share a link to this post with mylocal homeschool e-loop. Cute idea. Thanks! so she will not crash the glass window or try to jump to the window..